Can these companies make taking a bus cool? 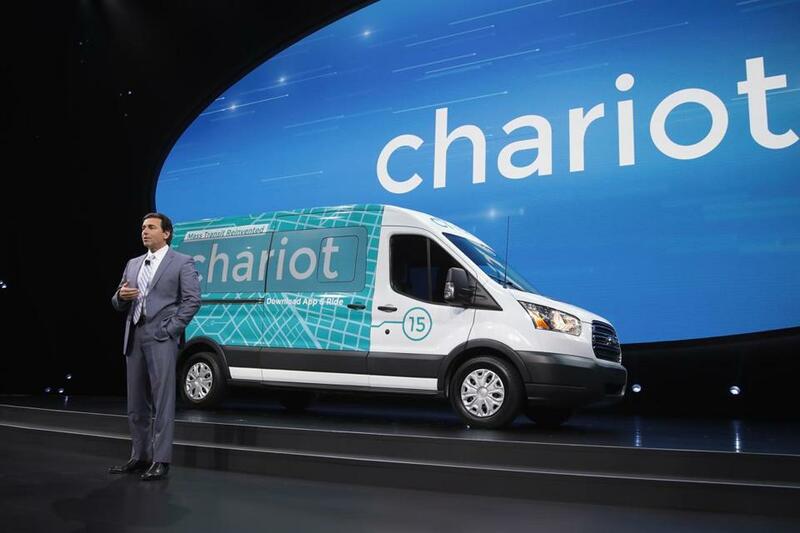 Mark Fields, chief executive of Ford, spoke about the Chariot transit service — which was recently purchased by Ford — earlier this year at the North American International Auto Show in Detroit. The entrepreneurs launching private bus service in cities like Boston, San Francisco, and Austin like to talk about “pop-up urban infrastructure,” “on demand” transportation, and, in the words of Ali Vahabzadeh, chief executive of Chariot, “reinventing mass transit.” They also don’t mind being dubbed “Uber for buses” by the media. But for companies like Chariot, acquired last September by Ford Motor Co., and Bridj, a startup headquartered in Back Bay, the comparison to Uber only goes so far. Yes, you use an app to access the service, and each ride gets billed to a credit card. Like Uber and rival Lyft, the two bus companies might soon be dueling for riders on the streets of Boston and other US cities. There are, however, many ways in which even app-enabled bus ridership still feels like riding the bus: You need to tromp to a stop and wait for the vehicle to arrive. Once onboard, you’re still very much a victim of Boston traffic; a scheduled 12-minute Bridj trip from Coolidge Corner to MIT on Thursday stretched to 26 minutes. Even though the seats are leather, you still might be shoulder-to-shoulder with your seatmate. And unlike public buses, startups like Bridj and Chariot operate only during rush hours and not on weekends. There also are plenty of routes they don’t serve. It can be a frustrating experience to punch in destinations to an app or website to get the reply, “Sorry — we don’t go there yet.” Pricing ranges from $3.50 to $5 per ride, though Chariot does sell unlimited monthly passes. Bridj and Chariot both launched in 2014, in Boston and San Francisco, respectively. Neither has raised anywhere near the billions of dollars that have poured into popular car services. Bridj has raised just north of $6 million, according to chief executive Matthew George, and Chariot collected $3 million before it was bought by Ford for an undisclosed amount. Bridj expanded to Washington, D.C., in 2015 but discontinued service there a year later. (Bridj’s George now calls that a test of the economics of serving neighborhoods with “a lower average income by far than the rest of the city.”) A plan to begin service last summer in Austin never got out of the garage. “We chose to focus on a different project,” George says. Bridj now runs service in Kansas City, in partnership with a public transit agency. George dubs it “a massive success,” with riders rating the service 4.82 out of 5 stars. But only about 600 people rode the Bridj buses over their first six months of operation, according to the Kansas City Area Transportation Authority. Aside from that data point, it’s hard to get concrete numbers about how many people are using these new bus services. Vahabzadeh says “tens of thousands of users” take Chariot on a regular basis. Without supplying numbers for 2015, George says Bridj “grew by 550 percent, in terms of rides and revenue, in 2016,” and that the company plans to add more service to Cambridge and, “hopefully,” Somerville this year. The other part of the profitability picture might be whether these companies can operate without drivers in a few years’ time. George says Bridj is “actively working with a number of auto manufacturers” to explore self-driving electric vehicles. Testing could begin later this year or early next. For Bridj, Chariot, and other bus startups, survival and expansion might hinge on attracting more riders — and having fewer drivers on the payroll.